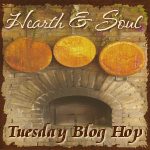 A warm welcome to The Hearth and Soul Hop, the blog hop for recipes that share food from the hearth to feed your soul, as well as articles about healthy living, real food, slow food, foraging, herbal remedies, local food, sustainable food, organics, gardening or any healthy eating information written in a positive and loving light. Please link posts that clearly fit The Hearth and Soul Mission using the linky tools below. Link directly to your post, not to your home page. Please link back to one of the hop hosts – through text link or a badge – within your linked post. The linky will stay open from 6pm Monday Eastern Daylight Time to midnight Thursday Eastern Standard Time. Please share the hop badge below to help promote the hop. Thank you for featuring my Caramelized Onions! Can’t wait to pin the rest of the features! Sharing our Savory Parmesan Muffins this week — soooo good. Thanks for hosting, April! Thank you for hosting, April! Thanks for choosing to highlight my Multi-Bean Chili. All of your selections sound really good. I’m going to go check them out. Good morning sunshine! …I guess it’s not morning where you are, is it? Hi April! Today I am sharing Cheesy Lentils and Greens, a grown mac’n’cheese (without the mac.) Whatever gets the kids to eat lentils, I say…. Thanks for hosting, and have a great week! Thanks for the shout out on the sassy pot roast! I am STILL enjoying leftovers. Today I linked up my new favorite way to prepare asparagus. Even though there is snow still on the ground in MN, I am enjoying spring vegetables!